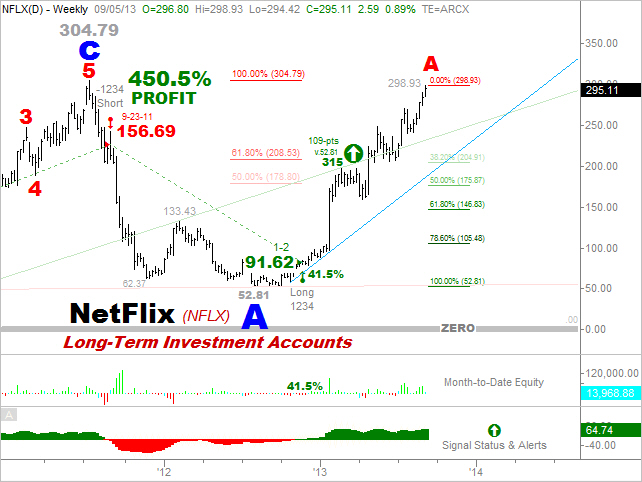 To date, NETFLIX is the top performer in the S&P 500 and a long-standing successful trading component within the Chart Cast Pilot portfolio. 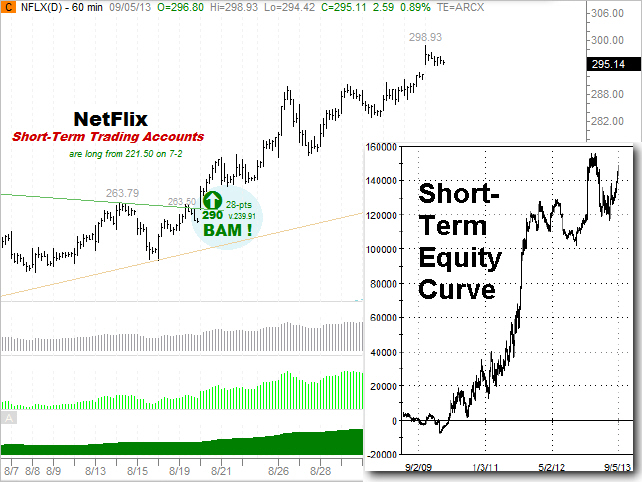 Glancing upon the rather volatile long-term chart, the last conclusion one might draw is that NETFLIX is the poster-boy stock for trend trading paradise. 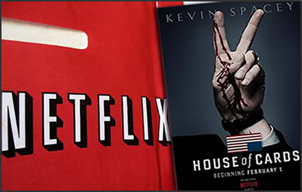 Most eloquently, the price action of NETFLIX quintessentially reflects the systematic boom and bust cycles resident within the house of cards otherwise known as the global financial system. In stunning contrast to the account-crushing roller-coaster effects that such a house of cards inevitably produces, our long-term equity curve (inset) exemplifies the stellar benefits of adhering to a methodical timeframe specific trading strategy. Simply stated, entrusting a time-tested mathematically proven approach to risk exposure, strategically exploits such booms and busts while amassing world-class trading profits and investment returns across several market cycles and time horizons. 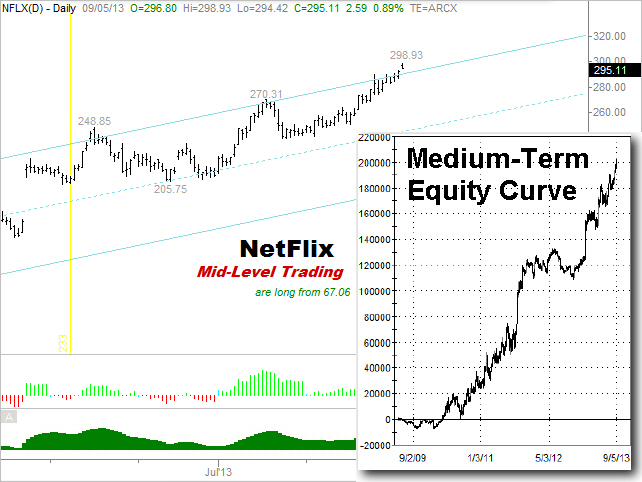 Although they have only improved further in 2013, readers with inquiring minds may click here for the entire history of NETFLIX trade statistics for each time-frame through 2012. 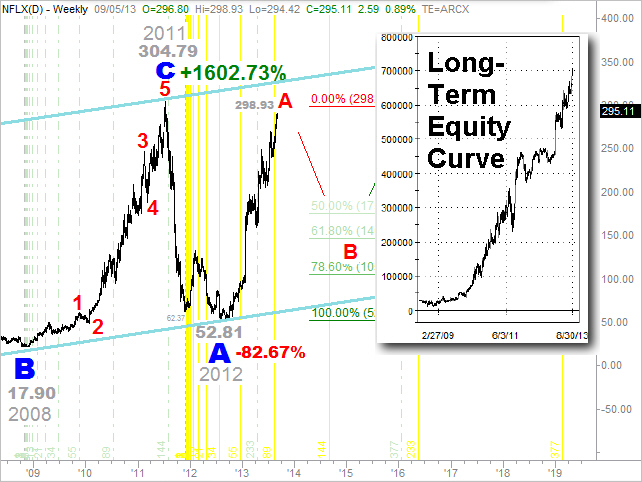 From an Elliott Wave perspective, despite accurately charting the wipe-out decline in 2012 to $52.81 as a cycle degree A wave, there was no way to have predicted the extent of the current rebound echo-boom, which now threatens to re-test the all time highs north of $304. In the same way that we were uncertain as to the extent and amplitude of the rebound rally, we are similarly uncertain as to whether or not the current thrust higher will be ending a bullish A-wave at primary degree, or terminating all of a rather bearish B-wave at cycle degree. Does such uncertainty concern us? NO, it does not concern us in the least. Why, because we have entrusted our time-tested and proven time horizon specific trading strategy to guide our present and future exposure in accordance with the mathematically quantified parameters that have proven accurate and historically profitable over numerous market cycles. It’s that simple. The remaining two charts and equity curves shall attest that in addition to the stellar performance in long-term investment accounts, both our medium and short-term time horizon specific trading accounts are faring equally as well. In closing, no matter what unfolds, when or how, we should all realize that amidst the house of cards otherwise known as the financial sphere, an abundance of shocks lay in destiny’s queue that will affect everyone’s immediate and longer-term future. 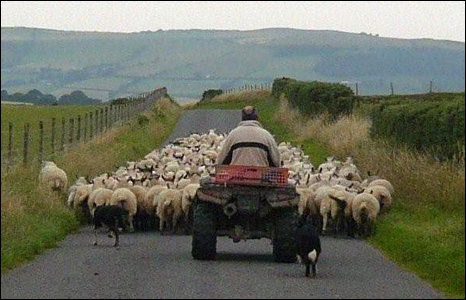 Let’s go people, it’s time to move toward that which best assures safe and PROFITABLE passage. If you are not sure what kind of trader/investor you are, click here to find out which of our electronic trading-alert services might suit you best.